How much does a solar electric system cost for my home? What are the government incentives? Solar seems expensive, how can I reduce the cost? Does Delta Solar Electric offer financing? What is the required cleaning and maintenance? What about fog and clouds, will the system still work? Will my meter actually go backwards? Why not install an oversized system and sell the excess power to SDG&E? What is the average size system and how much space will it take on my roof? Can you install solar on my tile roof? Which direction do the panels need to face? What is the Wattage and Voltage of your panels? When can you install my system and how long will it take? When do I start saving money? Do the panels really last over 25-years and how can that be possible? Cost is mainly based on the size of the system in Watts and estimated installation time and materials based on your site specifics. The system sizing options for your home will be determined by how much electric power you are currently buying from SDG&E, combined with your goal of how much you want to produce with solar vs. continue to buy from SDG&E, if any. A rule of thumb to estimate system cost is to multiply the amount of your monthly electric bill you want to offset with solar by 80-100. This will help to estimate the net system cost (after government incentives). The cost can be more or less depending on specific usage factors and your desired energy offset. The federal government is offering a 30% tax rebate with no cap, saving you thousands of dollars. California’s solar rebates are on a “first-come, first-served” basis and rapidly declining. The sooner we reserve your rebate with a simple application, the higher it will be, regardless of when we actually install your system. “Reduce and Produce” – A small investment in energy efficiency measures such as CFL lighting, Energy Star appliances, and a multispeed pool pump may help you make the decision to invest in a smaller less costly system. Our goal is to save you money by both reducing your usage through energy efficiency, and producing free energy with solar. Just ask us for a free energy audit with specific recommendations. Yes, Delta Solar Electric is partnered with a local credit union branch that offers our customers California’s only low-interest solar specific financing; up to 100% of the system cost can be financed. You must have good credit and your rate can be as low as 5.25% fixed rate, even with little or no equity in your home. The terms vary and can be up to 15-years and there are no pre-payment penalties. In almost all cases your savings from solar will more than cover your interest cost for this unique solar loan. Why lease when you can own your system today? Most solar leases use cheap Chinese-made solar panels with toxic 3.9% annual escalating payments no path to ownership, even after 20-years of payments. With your new solar electric system your payback begins immediately! You start saving 7%-12% of your net investment the first year and your annual savings will increase directly proportional to future SDG&E rate hikes. The best part is that unlike most other investments; your annual return is in the form of $ savings, so it’s tax free. Your solar investment offers a much higher return than even a high-risk tax free bond and since it is tax free and consistently rising with SDG&E rates, the net return is much higher than any other investments, an excellent addition to a well-diversified portfolio. The solar panels are warranted by the manufacturer for 25 years and there are no moving parts and very little or no required maintenance over the 30-40 year life of the system. Rain does a great job of cleaning the panels. Although not required, rinsing the panels with a garden hose during extended periods without rain may slightly improve production. The inverter has a 10-year warranty and may need replacing after an average of 15-years. Chances are there will be more efficient inverters available at that time so it may pay for itself with increased production over time. Today’s average inverter cost is about $1500-$3000, or about 15% of the total system’s cost. Yes, your system may actually produce a small amount of power even when it is raining, as it is powered by energy that you may not see as sunlight. Your annual estimated power production utilizes 25-year weather patterns in your zip code and takes local weather into account when we review your estimated production. Yes, anytime you are producing more power than you are using your meter will go backwards and the new Smart Meters will record that amount, generating energy credits with SDG&E. At night your meter will always go forward and you will use some of those credits. SDG&E will switch you to an annual billing cycle so each year they will perform a “true-up” and you will pay them for the power you used or if you generated excess, they will send you a check for that amount. SDG&E will send you a statement every month but you only have to pay them (or they pay you) once/year. Since solar is sold “by the Watt”, a system twice the size can cost almost twice as much so it can be expensive. Eliminating costs for SDG&E tiers 3 and 4 usage (about $.30/kWh) provides the highest return on your solar investment. The next highest return is eliminating costs for Baseline and Tier 2, where your cost is lower at about $.15/kWh. Overproducing on a daily or monthly basis does not reduce your overall return since you are accumulating valuable energy credits that can be applied to usage at a later time. However, on your annual “true-up” date those credits will be converted to Dollars at a wholesale rate, comparable to SDG&E’s average cost to buy/produce power of about $.04/kWh. 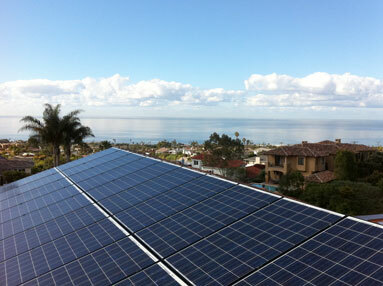 The average sized system in San Diego is about 4,500 Watts and will fill a 30’ X 12’ rectangle, consisting of 18 panels. Each panel is about 5.5” X 3.5” and they can be arranged in various patterns to fit your available roof space. A 4,500 Watt system will take about 360 Square Feet of roof space. Yes, about half of our systems are installed on existing tile roofs. We utilize California-made Snap-N-Rack racking which was designed specifically for Southern California’s tile roofs. For optimal production, the panels should face South, East or West and not North. They are normally installed flush to the roof or tilted to about 15-degrees on flat roofs or when ground mounted.
. Solar panels range from 220W-240W and 30V-45V. They are normally connected in series of up to 14 panels, so you system will operate at a very high efficiency; up to 550 Volts. Planning, permitting and product procurement takes 2-4 weeks and most systems can be installed and inspected in about 3-5 days. The final inspection from SDG&E will take 2-3 addition days. System starts generating electricity from the sun as soon as it is switched on and connected to the utility grid, following city/county inspection and utility interconnection approval. The power measured in kWh and logged within the solar inverter’s digital display. All power generation is your savings as that is money you would have spent to SDG&E, at a rate of $.15-$.38/kWh. The panels do last that long, the same technology has been in space since the 1970’s powering satellites. They are made of aluminum, copper, glass and silicon, with no moving parts. All manufactures offer a 25-year power output warranties with their solar panels, and it is not likely that companies like Sanyo, Mitsubishi, REC, Sharp, LG, BP, SunPower, Kyocera, Samsung, etc. would offer 25-year warranties if they did not complete rigorous testing and calculations prior to offering that length of warranty. Typical industry failure rates are 77/Million. Additionally, they do not need any maintenance as again they are electrical devices encased in tempered glass and aluminum. For example, glass can last one-hundred years or more without maintenance, as well as anodized aluminum, there are plenty of aluminum boat masts in San Diego that look fine, even though they have been in the salt air and sun for 40-years or more. Silicon is the same as glass, does not rust, deplete, etc. with weather. Also, all city/county codes require all mounting hardware to be very expensive stainless steel, sometime 10X the cost of zinc plated bolts/washers, etc. and the reason is that it needs to last 50+ years, since that can be the life of the solar system. Also, all racking is anodized aluminum so nothing will rust away on the roof. Assuming the manufacturers offer 25-year warranties, it is assumed that they will last beyond the life of the warranty. For example a laptop computer has a 90-day or 1-year warranty, but not likely that it is expected that it will need to be replace after just a year or less, chances are it will last 2-3 times the warranty. Therefore, a product with a 25-year warranty is likely to last well beyond the warranty period. As it is impossible for all solar panels to stop producing power exactly 25-years after they were installed.